(64804/64801) – Judy Stiles of MSSU is also the KGCS General Manager and host of the Newsmakers spends time with the Joplin City Council candidates in a LIVE FORUM. Every candidate shares their personal history and passion for running for office. Then also answer questions related to recent tourism study, budget concerns for city employees, final phase of tornado redevelopment and other issues that are being discussed currently. “KGCS has a long history of covering city government, and this is another way we can help with communications with residents,” said Stiles. RV PULLS OFF I-44 WITH FLAMES SHOWING - THEN DRIVES NEAR PUMPS??? 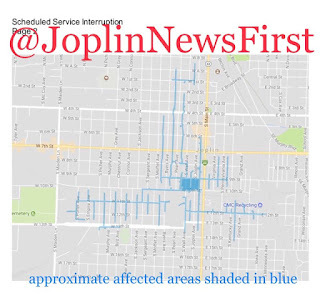 (Joplin MO) — Joplin Police Department have confirmed with Joplin News First they are currently in an active situation and have no comment at this time. However the public should not be alarmed. At the very beginning of our LIVE! cast you can see a vehicle pull up. It's a JPD patrol wagon, where they appear to load up multiple people and transport. According to eyewitnesses in this unnamed neighborhood it’s a shady house with a ‘whole lotta traffic’. So this could possibly be a warrant being served on a residence. You can see the Metro Emergency Transport System/METS ambulance on standby in case there are any injuries to officers or occupants. 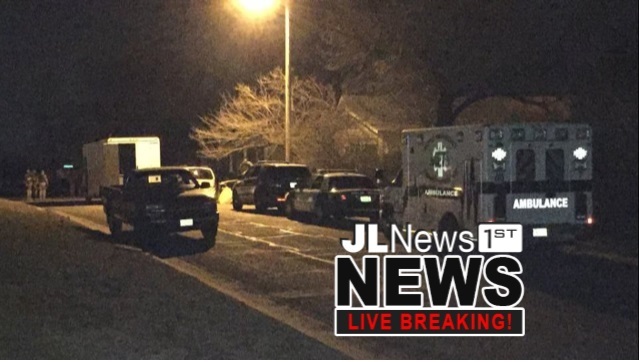 JPD will communicate with Joplin News First after the scene is clear and secure. We will have more details as they become available or whenever it becomes appropriate to release them. Thanks for the anonymous tipsters tonight. 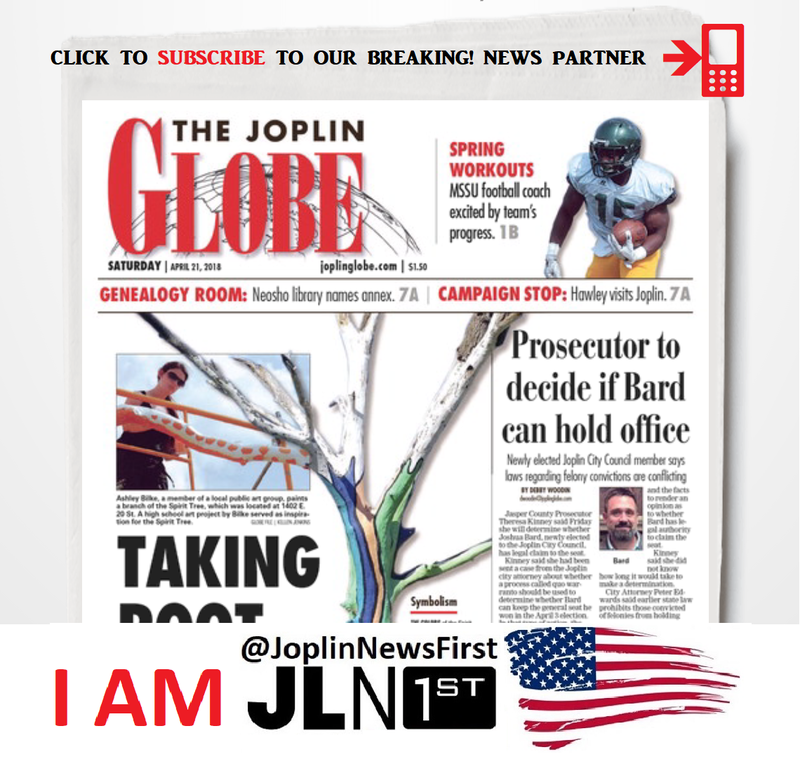 You are all Joplin News First. 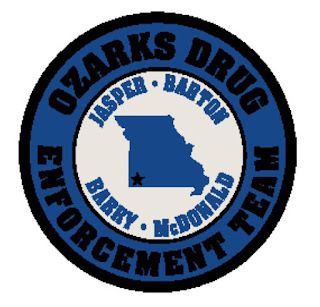 (64801) – Joplin Police Department tell Joplin News First tonight exclusively that 5 individuals were taken into custody while serving a narcotics warrant at 1408 East North Street. Updated Thursday information from Commander Chad Allison of ODET, "Suspected Methamphetamine and a firearm were seized from the residence. 5 suspects were arrest from the home." 1 - Willard Gage 40 years of age was charged with Delivery of a Controlled Substance and Unlawful Use of a Weapon. 2 - Karissa Barlett 35 years of age was arrested for Delivery of a Controlled Substance and Unlawful Use of a Weapon. 5 - Chris Colon was arrested on 7 warrants. Charges are currently pending with the Jasper County Prosecutors Office. There were no injuries. It was a quick and effective operation. In the video you can see the JPD Patrol Wagon/Van pull up to the residence. Then multiple people appear from the shadows already in custody and are then loaded and transported at once. Thanks for the anonymous tipsters tonight. You are all Joplin News First. We can only cover breaking news when you let us know first. (64804) -- Our Joplin News First tipsters alerted us to this possible HAZ-MAT situation. It was told to us a heavy acid smell was observed in one of the sewage buildings. No reports of injuries while we were on the scene but depending upon wind directions and if there was a spill it would be determined in part by the Department of Natural Resources if anything contaminated the soil and/or runoff made it into an area creek. Now on Tuesday morning official word from the Joplin Fire Department regarding an acid spill of 5-10 gallons "some point" in the day? A dangerous situation avoided this time. This all happened moments after the Joplin City Council Meeting where the Joplin ODOR ISSUES Group presented concerns. 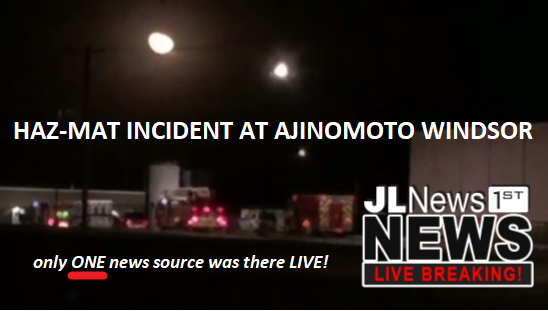 On Monday, March 5, 2018, the Joplin Fire Department responded to a report of a fire alarm at Ajinomoto Windsor, 3131 S. Quail Ave. The first arriving crew arrived on scene at 9:29 PM and they were met by Plant representative advising of a possible chemical release in the wastewater treatment building. After further investigation it was determined that approximately 5-10 gallons of sulfuric acid had been spilled on the ground at some point during the day. It began giving off vapors in the building. Crews were able to ventilate the building and the company took over the scene from there. At no time was there any danger to the public or employees. The Company did an outstanding job of making sure there were no issues or further hazards. There were no injuries to civilians or firefighting crews. The Fire Department responded with 5 units and 15 personnel. The Fire Department was assisted by Joplin Police Department and METS Ambulance Service. 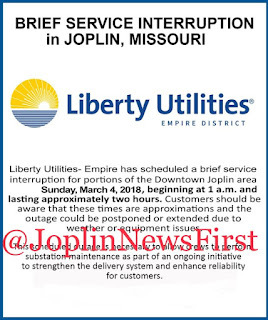 For more information, contact the Joplin Fire Department at 623-0403 or 624-0820, ext. 1300. 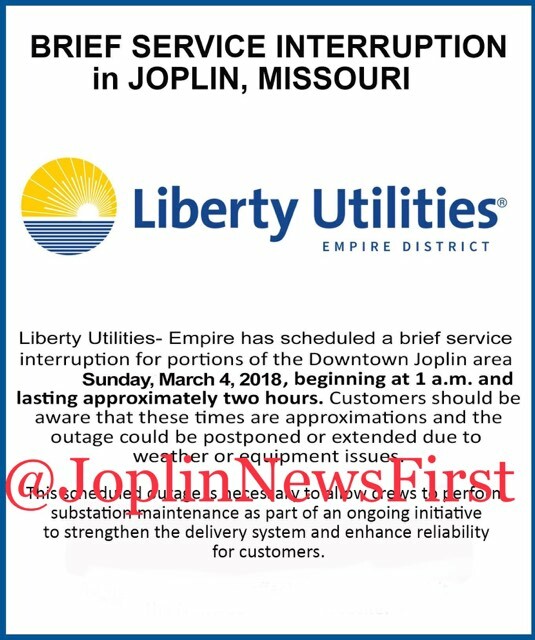 (64801) – About 700 homes and businesses will be without power overnight Saturday night/Sunday morning this weekend as Empire District will have a brief service interruption and electricity will be off. This scheduled outage is the result of substation maintenance and is necessary to ensure the safety of those involved. This project is part of an ongoing initiative to strengthen the delivery system and enhance reliability for customers. 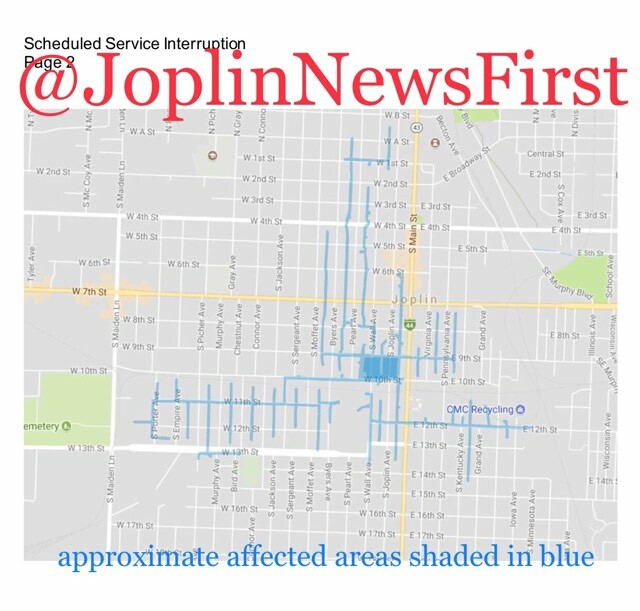 The Joplin Police Department want to remind everyone that some traffic lights will be dark in some locations. Also all streetlights will be out so that makes traveling a little treacherous. “Anytime a stoplight is not functioning, drivers are required to come to a complete STOP at the intersection and treat it as a 4-way-stop,” according to the JPD. (Springfield MO 65802) — The Joplin Police Department helped to protect the #2 person in line for the Presidency today! Speaker of the House, Congressman Paul Ryan (R-WI), was in Springfield today and Joplin Police Officer Randy Black and K9 Fighter were a part of the protection detail. According to the US Constitution, the Speaker of the House is #2 in line of the Presidency right behind the Vice President. K9 Fighter is trained in explosives detection and regularly works in the region protecting our countries leaders when they travel near Joplin. Thank you JPD! And officers Black and K9 Fighter for your service!